Nice box, big price at best buy, but absolutely no instructions in the box, the provider assumes that we are all computer savvy, video works great, but what do I connect to the 3.5mm ?? and what gets connected to what appears to be a phone usb connection. a little piece of paper in the box would help a lot, or, print needs and requirements on the side of the box. This web site does not describe any direction either(not readily seen) Sorry not a smoke test kind of guy. Thanks for any effort in providing a solution. Thank you for reviewing our HD2VGAA2, we apologize the use of these ports was unclear. 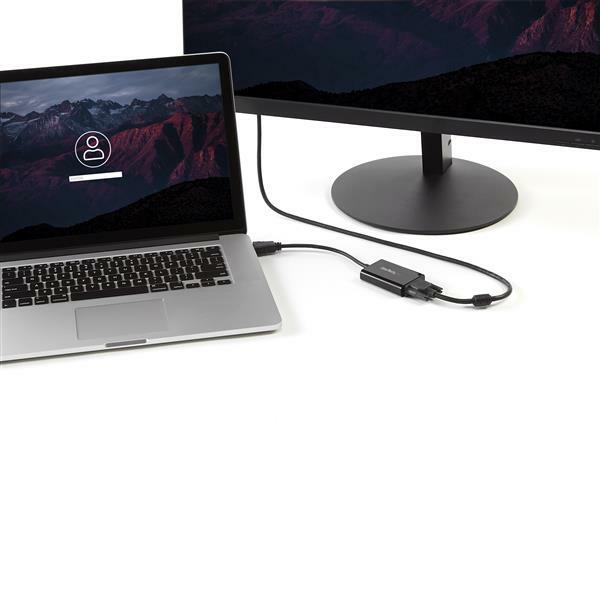 This adapter is made to take an HDMI signal from a laptop or other HDMI device, and convert it to a VGA video signal for a VGA monitor. The 3.5mm jack should be connected to any speakers you want to use for sound. The Micro-USB port on this device is not commonly needed, but some setups need extra power to the adapter and for those rare cases you could use a USB to Micro-USB cable. If you have any further questions or anything is unclear, please contact our support team available 24 hours a day 5 days a week at 1 800 265 1844 or www.startech.com/chat. 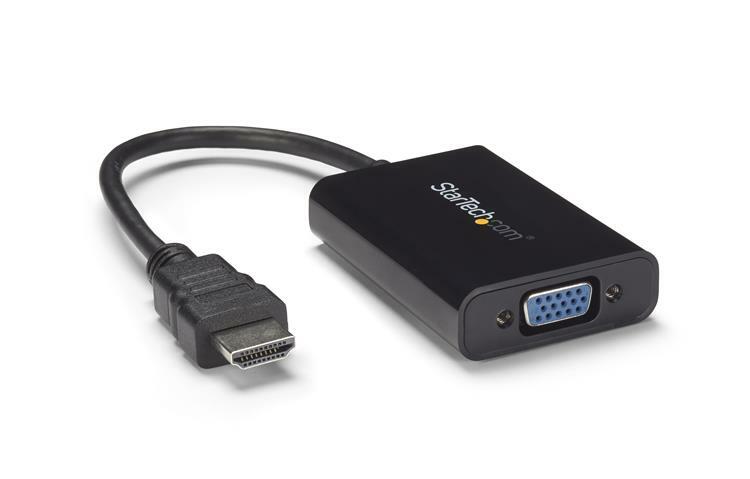 Just bought this adapter to be able to connect my Raspberry Pi 3 to an Acer VGA monitor. First attempts brought no success without external power. After plugging in my cellular charger Rpi screen shown up for about 2 secs then display went black. 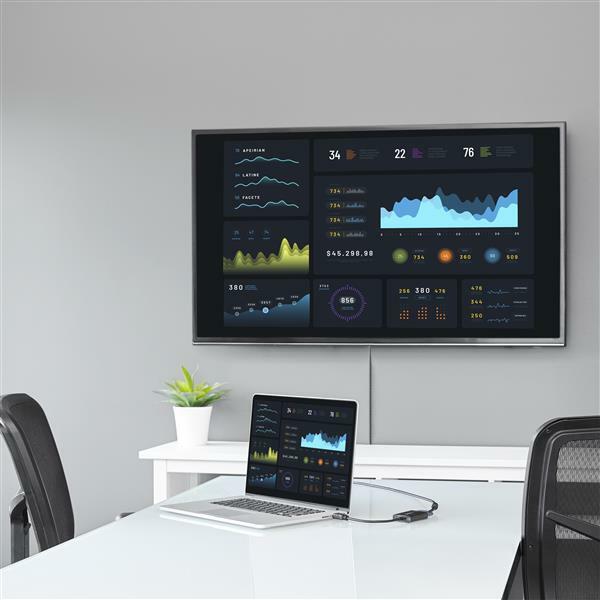 The same happened when I connected the monitor to my decent MacBook Pro laptop. Now I'm stuck and don't know where to go now without proper documentation. Would it be possible that external power is not enough? Thank you for leaving your feedback on HD2VGAA2. We apologize that it isn't working for you! Since it works for a few seconds before cutting out, it sounds like it may be having power-related problems or simply be a faulty unit. We encourage you to reach out to our Technical Advisors for troubleshooting. We're available 24 hours a day, 5 days a week, at 1-800-265-1844 or https://www.startech.com/Chat. I got this product for test and it is small and easy to use. I tested it with Dell, HP and Asus without a problem as good plug and play product. The only issue was on the Lenovo laptop which I had to reboot it to work. I recommend this adapter. Disclaimer: I received this product in exchange for an unbiased review. (3 stars) Works best with external power. My Dell and 2016 Macbook Pro work just fine with this adapter. Even passing it through a USB-C to HDMI adapter on my 2017 Macbook works. No drivers, it just works. Don't try to go over FHD though. On my Chromebook and older HDMI enabled laptops though, it required external power to be stable. I just used a small USB to mUSB cable, and it worked. Also usable with a USB charging brick (nothing major). Build is solid, but took a couple stars due to the lack of ANY documentation in the box. Most of us know to go online and look, but.... I leave this in one of our conference rooms (has a VGA projector), with the USB cable attached. No complaints from users! I have tested this adaptor with a different combination of computers, monitors and projectors without any big issues. The adapter comes in a small box the size of a cell phone but the thickness of two. The box is very difficult to open and the adapter sits in a flimsy tray within the box. The packaging was all wrecked removing the adaptor for the first time. The adapter has a VGA port on one side and the other side has a 3.5mm audio port, HDMI cable and Micro USB-B port. The adaptor says that is doesn't require any power so I am unsure why it has a USB port on. There are no included instructions in the box, on the box or on the web site to provide more information. When I first connected this adaptor to my computer I was shocked how quickly it was working. If I connected the HDMI port first to my computer then almost instantly of connecting a monitor the video and sounds were working. 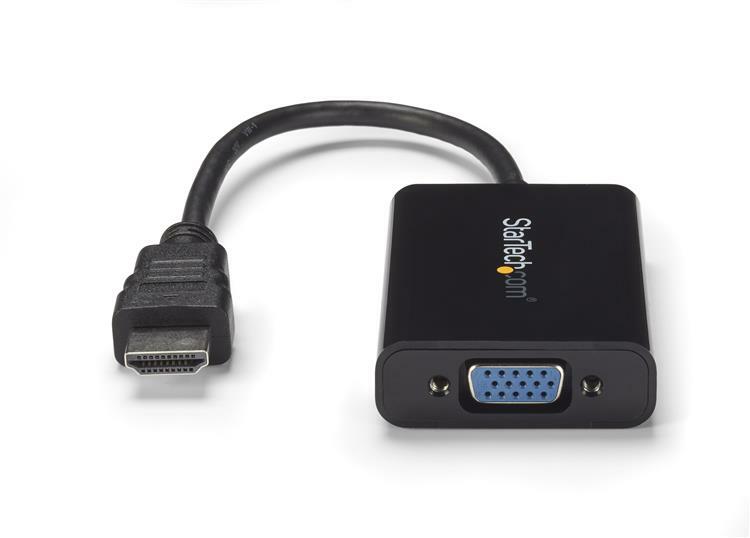 If I connect the VGA cable first, then audio and video start within 3 to 4 seconds as does any normal HDMI monitor. The sound and picture from this dongle were crisp, clear and without any delay. When I first played copy protected content (i.e. Netflix) the dongle stopped working and I had to disconnect then reconnect and it started working again. I have not been able to reproduce this issue since but I thought it would be worth noting. This adaptor starts working very quickly. I had doubts about converting HDMI to analog but my mind has been changed since using this adaptor. I received this product in exchange for an unbiased review. Just received this today, as soon as I plug it onto my mac book pro, the laptop screen starts flashing, indicating it is receiving signals from the external monitor but also losing it all the time. Changed several VGA cables but no difference. Changed to apple mini DP to VGA adapter and that works fine. Hi, Thanks for sharing your review of our HD2VGAA2. We're very sorry for the confusion, unfortunately this adapter does not support 1920x1200. We are in the process of removing 1920x1200 from our list of supported resolutions. I noticed your KDS display also has DVI inputs. Please consider exchanging this adapter for our HDDVIMM3 adapter cable instead. It will work at 1920x1200. We sincerely apologize for the inconvenience this has caused. Thank you. I bought this to use at our local Junior College to tie into their audio video system from my non VGA laptop. Took off and worked like as advertised and the audio was excellent as well. What is the function of the Micro USB connector ? Hey, Iashen- the Micro USB is a way to provide power for better conversion for devices with weak HDMI output. If I understand right (and I could be wrong) it might be necessary for D/A audio conversion, too.